This sermon was given for the Confirmation Service at Saugatuck Congregational Church on June 8, 2014 (Pentecost Sunday). The text for the day was Acts 2:1-21. The thing about learning a language is that it isn’t just a matter of learning new words for the same thing. It’s also learning a new way of thinking. This past year, I have gotten to spend a lot of time with our confirmation class as they prepared for today. I’ve gotten to see you guys grappling with a new language of sorts, the “language of faith,” as we have worked through the year. And like any language, it is one that challenges us to think differently about the world, not just to adopt new names for familiar ideas. One of the recurring discussions at confirmation class, as you might expect, is about seating arrangements: making sure you have the right seat in the right chair. ‘Cause not all chairs are created equal. Some have wheels, some squeak, some are more comfortable than others. It’s a big deal to make sure you have just the right one. Well, in English, we call a chair “mine” or “hers,” but in Spanish you would say, “La silla de ella.” Literally, “the chair of her.” There is no “mine” or “his” or “Ben’s” or “Marion’s” chair. The chair is “of” its owner. It somehow is a part of them. If anything, the chair has some claim on me, rather than me having a claim on it! Now you can overanalyze that sort of thing, but the point of this simple example is that learning a new language is liking entering a whole new world of thought. And similarly, learning about and thinking about what it means to call the Christian faith our own, requires us to look at the world in a new and different way. Either we accept them. Or, we write them off as bizarre, strange, or foreign and reject them. 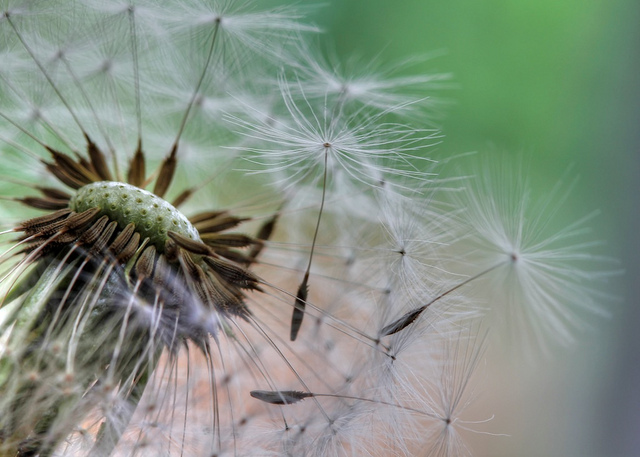 “Sent by the Spirit…” Blowing Dandelions photo by Doug Wheller on Flickr. Copyright Creative Commons. Used by permission. On Pentecost nearly 2000 years ago, something remarkably new happened. People who did not share a common language suddenly understood one another. And as the onlookers realized what was happening, a commotion broke out. This was totally outside their realm of experience, something they didn’t even have a concept for! It was completely new: the Holy Spirit descending as a “tongue of fire” and totally changing the way language worked. We have a hard time wrapping our minds around that today, but imagine how crazy that must have seemed in the moment if you were there to witness it. And to defend against this accusation, up to the microphone steps Peter. But in this particular instance, Peter does something brilliant: He defends this “new” experience of the Holy Spirit and what it is doing right then and there by appealing to something very old: a prophecy from the book of Joel in the Hebrew Bible. Its this image of a world in which the Spirit of God is actively stirring each of us to see how God is working in the world, to envision the new creation that God is making in our midst, to dream of what might be possible even as we struggle with what is right now. This idea of hope and vision springing forth from God’s Spirit at work in each and every one of us is pretty profound, I think. But it raises a question: what does that look like? And unfortunately for you all, seven years and $100,000 worth of academic study in theology still leaves me without an answer to that… And I think that’s because there isn’t necessarily an answer. God works in each of us in varied ways because each of us have different needs, different experiences, different stories. Despite this, one of the most important things we have tried to teach you confirmands this year is that what holds this faith together is a common bond of covenant. “The young shall see visions and the old shall dream dreams.” God is at work in all of us, and that will not always look the same. The work of the Spirit is not to make us into exact replicas of one another but to inspire us to see what God is capable of doing in our lives and our communities. To transform our understanding and teach us a new language. And like those passerby’s who saw the disciples start speaking in a multitude of languages, this can challenge us and surprise us. Which is why we need a community, and why we make covenants with one another. Because even though our own journey and our own experiences may be “new,” they are also a continuation of something much older than any of us. We are part of something larger than ourselves by being in this community, and we have the support of many more who have been here before us and we will pass along this faith to many more who will come here after us. So when you are confirmed, you are making promises to be part of a community of people who are all on a journey together. You are promising to continue to grapple with the meaning of faith and the hope that it brings. You are promising to continue growing and learning, and all the while to support one another, and to reach out for support from one another when you need it. My prayer for you today is that God’s Spirit will give you the strength and the courage and the faith to do just that. Amen.